Here are some of chemists’ pet peeves about discussion on social media and the internet in general. The list is from the article 5 simple chemistry facts that everyone should understand before talking about science posted on the blog The Logic of Science. Thanks Ken for this. Agree with nearly all the points. Trying to take the non-scientists’ point of view, there is a fear factor semi-justified: Our metabolisms are usually effective in dealing with chemical insults – our much abused livers, by and large, do a great job. However substances that are new to our metabolism or new to our environment and which we may not have evolved pathways to deal with, are a potential problem Asbestos – a lovely “natural” chemical comes to mind. Another example is 2-4 dichlorophenoxyacetic acid, probably quite benign, (I used it in my garden in the 60’s) but the preparation usually includes traces of so-called dioxins which are regarded as serious toxins. This example tells us the the nominal substance may not be problematic in itself, but that unexpected effects are always possible. The solution is more and more careful chemistry. And it should be said that quite contrary to the “natural-is-safe” myth, substances in traditional foods and spices and recreational rugs that are regarded as safe, may have unnoticed cumulative carcinogenic or other toxic effects . The occasional ritual smoking of tobacco was no doubt quite harmless for native Americans. Kava, used widely in the Pacific has been banned in some European jurisdictions. And if the current fad has any basis, even gluten in wheat may have its dangers. Begs the question of, “Well, if there is mercury in the vaccine, and mercury is indeed a well known toxin when introduced into the human organism, WHAT exact chemical(s) does the author suggest the mercury has combined with to make it inert within the human body? In other words, what chemical within a vaccine neutralizes the toxicity of mercury? Hmmm? Can’t understand your question, Don. Thiomersal, commonly known in the U.S. as thimerosal, is an organomercury compound. This compound is a well established antiseptic and antifungal agent. It is used in vaccine for obvious reasons but is currently being phased out as a precautionary measure. There is no evidence it is unsafe. It contains mercury but is not mercury – just as it contains sodium and sulphur but is not sodium or sulphur. And in the same way that proteins contain carbon and nitrogen but are not cyanide. That is the point being made. Great post Ken, that is spot on regarding the biggest chemical misconceptions that are seen on the internet. 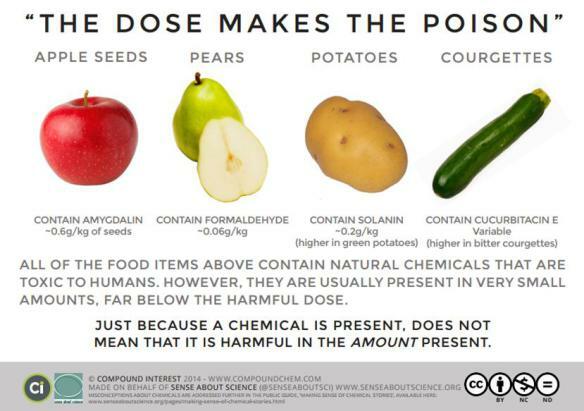 Don, you might also want to reconsider Ken’s second point that it is the dose which makes something a poison. Thank you, it aids in my understanding .. .